For individuals who suffer from severe obesity, often times weight loss and exercise is not enough. There are other ways to remove the weight, but keeping it off might prove problematic. Liposuction is going to remove the fat tissue, but if bad eating and exercising habits remain, the weight is just going to come back. That is why a gastrectomy is required. This is where part or all of the stomach is removed. This is done in order to reduce the amount of food consumed, which allows the person to shed often hundreds of pounds. This is an extreme weight loss surgery and is only recommended for people with life threatening issues taking place due to their weight. 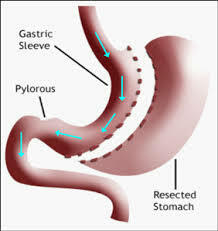 The gastrectomy comes in two different forms. There is a partial and then a total. The partial simply removes part of the stomach while the total removes the entire stomach. A total removal is going to provide the greatest weight loss, although it is also essentially cutting out a vital organ, which means the person has to completely reduce the amount of food they eat. The procedure lasts anywhere form four to five days and they then must remain in the hospital for up to two weeks following the surgery. The individual is not allowed to eat or drink anything for the first five days after the procedure, including water or ice chips. All hydration is provided through the IV drip. This is to allow the stomach to heal, which is especially important if there is no longer a stomach at all. Once the stomach (or lack of stomach) heals, the individual is able to start eating again, although they need to consume special packets of vitamins, minerals and protein, in order to make sure they receive their required daily dossage.